Remember how the Harry Potter franchise started off all bright and cuddly, with fresh-faced young wizards roaming the wacky and welcoming halls of Hogwarts, making new friends and getting into adventures that were a little dangerous but mostly just fun? Yeah, those days are good and over. 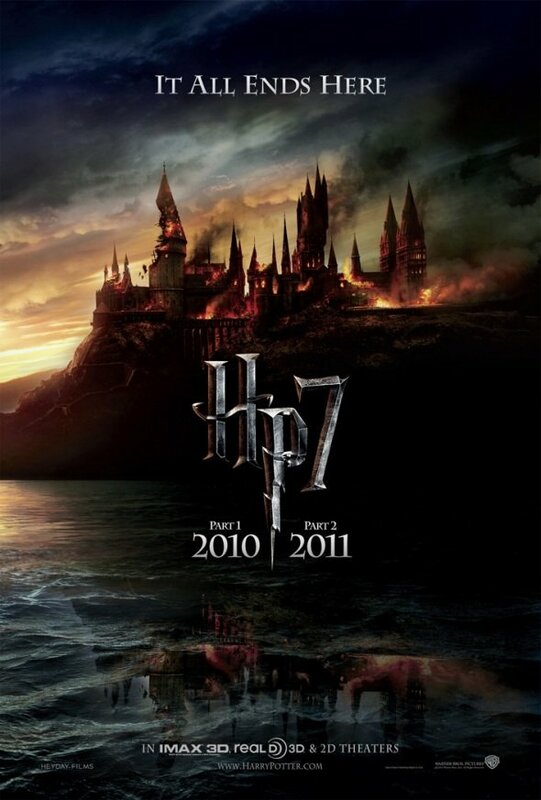 Nearly everyone knows that the story takes a turn for the super-dark in the finale, Harry Potter and the Deathly Hallows, but you still may want to prepare the young ones before looking at the new teaser poster released by Warner Bros. Yup, there's Hogwarts, the one place Harry ever felt like he was at home… and it's on fire. Happy Fourth of July to you too! I actually really love this poster for its simplicity-- it's a teaser poster, after all-- and the way it says pretty much everything about the high stakes of the final films in one striking image. It's also a weird callback to real life events, when a small fire broke out on the film's set. But the Hogwarts blaze, as you'll see below, is a lot more substantial. Check out the full new teaser poster.